The strong mid-latitude cyclone which moved out of the Central Plains on Wednesday and into the Great Lakes Region Wednesday night continues to impact a large portion of the Great Lakes primarily from Lake Michigan eastward through Lake Ontario and Lake Erie and adjacent states and provinces. 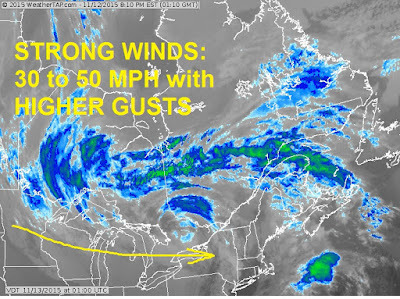 Strong winds extend across a large portion of this region stretching all the way from the Dakotas eastward through Minnesota, Wisconsin, Michigan, and eastward across portions of Iowa, Illinois, Indiana, Ohio, Pennsylvania, New York and the adjacent coastal regions of the Canadian province of Ontario. Various storm warnings and advisories are in effect including GALE WARNINGS, STORM WARNINGS, COASTAL FLOOD ADVISORIES, and OTHER WEATHER STATEMENTS and STORM DAMAGE REPORTS related to this large and rather strong mid-latitude cyclone. If you are in areas that are being battered by these strong winds and in coastal regions where wind and wave hazards are threatening your area KEEP UP WITH THE FORECAST. This situation should begin to subside in about 12 to 18 hours as the system continues to move northeast and away from the region. Do you believe in weather modification?